In the long press handler, check the state (to prevent multiple firings of the gesture recognizer from making the menus spaz out), and then set up the menu thing. The delegate method (accessoryTypeForRowWithIndexPath) has been deprecated, so don't use that. Use UITableViewCellAccessoryCheckmark for a checkmark. Use UITableViewCellAccessoryNone to remove the checkmark. Some tableviews have the short-cut list thingie on the side, which apple calls the index. The index is section-based - each entry in the index corresponds to a section in your data. So if you have a pretty flat list (just an NSArray, for instance), you'll either need to map section-> index, or split up your data so it's physically organized in section/row. And then override these. In this case, I split up an array into an array of arrays, each sub-array being the contents of a section that corresponds to a string to display in the index. _tableIndex is an array of strings for display of the index. // If your table can have <= 2 items, you might want to robusticize the index math. You might have some rows in a UITableView you don't want to be selected. Override willSelectRowAtIndexPath, return nil to reject the selection, return the passed-in indexPath to use as-is, or return your choice of selected cells. // don't select the top row sort control. You can add buttons to a UITableViewCell. The fun part is figuring out what row that button lives on. Assuming that the button is added right to the cell, you can look at the button's superview to get the cell, and then ask the tableview for the cell's section and row. // do something with indexPath.row and/or indexPath.section. [_cues removeObjectAtIndex: indexPath.row];  // manipulate your data structure. [self updateUI];  // Do whatever other UI updating you need to do. Entering and exiting UITableView edit mode has a cool animation. If you've got a custom subclass, your goodies don't move unless you override layoutSubviews in your UITableViewCell subclass. Any view position changes will automatically be animated. The showingDeleteConfirmation test is so you don't move things around if the user does the "swipe-right to show delete button" thing. Implementing this method in your UITableView datasource will make the table draw the little rearrange marker on each row. [cue retain];  // Let it survive being removed from the array. Set yourself up as the UITableView delegate first. // Do something logical with indexPath.row, etc. You can also scroll to PositionTop and PositionMiddle. If you crash, make sure you've done a -reloadData on the table view prior to trying to scroll. Boilerplate for UITableView DataSource stuff. The subtitle cell has a large label and a smaller gray-text sublabel. You can return a title for a footer. I always forget what each different kind of tableview cell looks like. Images shamelessly stolen from MobileHIG. 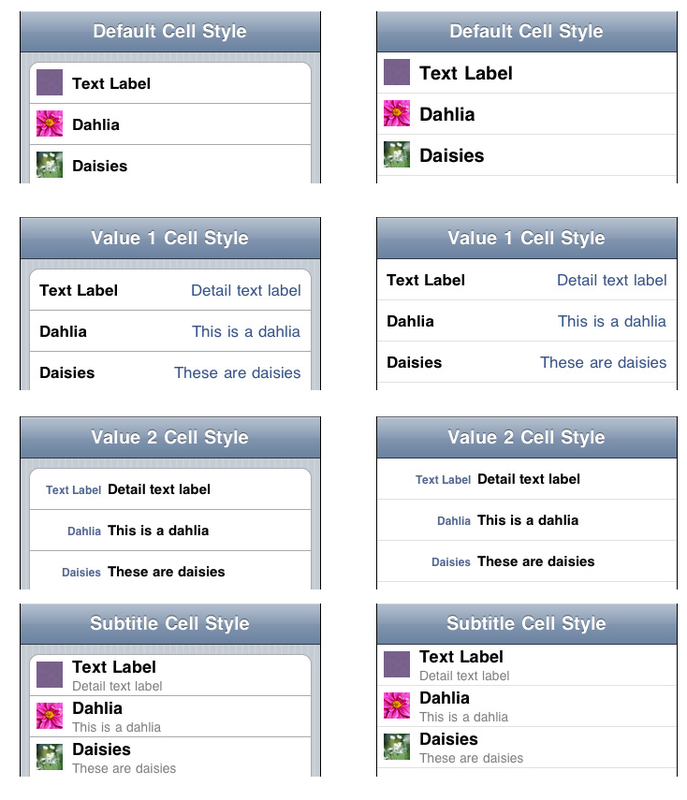 The appropriate constants are UITableViewCellStyleDefault, UITableViewCellStyleValue1, UITableViewCellStyleValue2, and UITableViewCellStyleSubtitle, and settable properties include imageView, textLabel, and detailTextLabel. You can use a nib file for table view cells pretty easily in iOS5. 1) Make a nib with a single object at the top, a UITableViewCell. Lay it out as you wish. I use view tags to get to the objects contained therein. 2) Register the nib for a cell reuse identifier. I do it in my -viewDidLoad. If you have a grouped UITableView, the top and bottom cells of each group are rounded. If you have an image in the cell, it will obliterate the left-hand corners. There's a number of ways to properly fix this : pre-clip your images with some transparency at the corners. Set up a clipping path before drawing the cell, or playing with the image view's cell layer. Or you can hack it by setting the cell's indent to 1. That scoots the whole cell contents over by 10 pixels, letting you miss the rounded corners. Really handy if you're prototyping, want something to look non-horrible, but don't want to go the full-blown correct solution. @IBOutlet var sessionsTableView : UITableView!